Launched in March of 2006, Weebly quickly gained popularity among non-techie types who want a professional-looking DIY web builder. Weebly has undergone a number of transformations since its launch, each improving on the original concept. 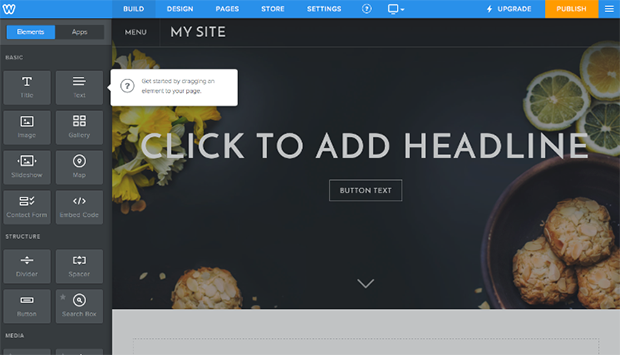 With its 2014 revamp, Weebly rose to the top ranks of drag-and-drop website builder editors. It’s the simplicity of use makes it one of the first choices for users who have zero programming skills. But is it all Weebly, or is it a bit wobbly? Getting started with Weebly is easy. You can either sign up with your name, email address, and password, or you can sign up with Facebook or Google+. Weebly offers four plans: Free, Starter, Business and Pro. 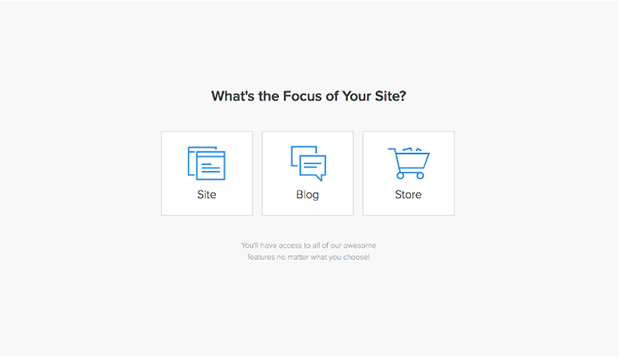 After selecting your plan, you’ll be asked for the focus of your site (Site, Blog or Store). Next, you’ll choose one of the templates and you’re all set to design your own website. 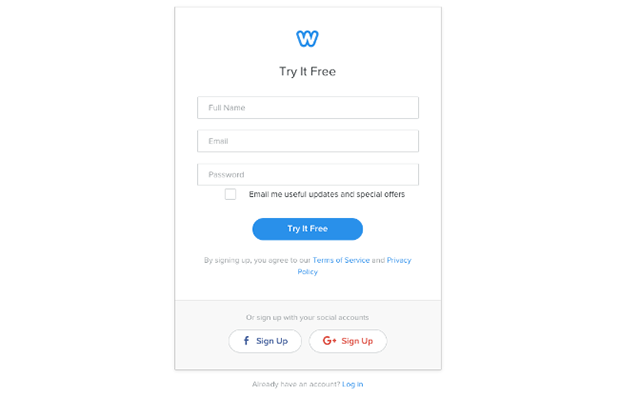 If you opted for Free plan, you will be assigned a free yourname.weebly.com domain. If you go with the Starter plan, you can use your own domain, but that will cost an additional $19.95 a year, with the first year being free. Even if you already have your own domain, you will need to upgrade to one of the paid levels to be able to use it with Weebly. Having all this in mind, using Weebly is a piece of cake. It’s totally WYSIWYG, so even if you have zero programming or website building skills, you’ll find building a website a pretty painless process. However, just because it’s easy to build your website, don’t assume you’ll end up with elements that are outdated or ugly. Not even close. When it comes to options, the more you pay, the more you get. However, even with the Free plan, you will be covered with all the basics. Although you’ll get more options with the more costly plans, the best argument for upgrading to at least a Starter plan is that you’ll be able to have a custom domain. If you want to be taken seriously, you really don’t want your domain to have weebly.com extension. With that, upgrades will remove Weebly’s native advertisement on the bottom of your page and give you more options, like HD video and a search box, both of which are quite useful. 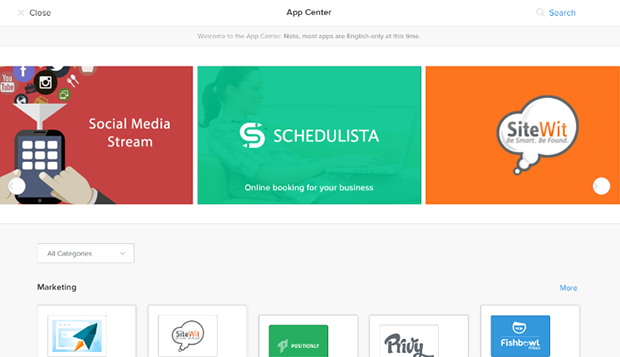 However, there is also an App Center in the Editor, so you will be able to upgrade your website even more. 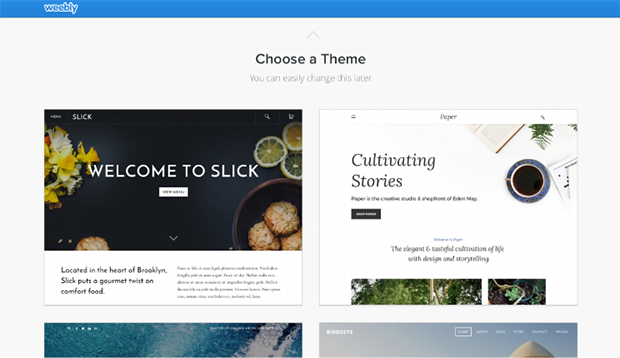 Some apps are free, some have free trials and some are paid, but all of them are nicely adapted to Weebly’s templates. Website editor has a very short learning curve since it’s drag and drop. All tools are smart—they automatically snap in place and previously added elements self adjust to make room for the new ones. This may irk a few perfectionists, but that is the price for having intuitive design elements. Trying to mess things up is almost impossible and if you do, you can easily delete your errors, although an “undo” option would be more practical. But it’s great that you make changes, such as text editing, directly in the editor. This enables you to instantly see the changes, instead of side-eyeing the sidebar that some of the competition uses. The editor itself is divided into six parts. On the upper bar, you will see Build, Pages, Theme, Store, Settings and a small monitor or smartphone icon that gives you the option of viewing the site in desktop or mobile format. Build is the main area where you construct your website. On the left, are all the Elements and Apps you need (each in their respective button/tab). All available elements are shown, but those that are out of your plan/price range will be noted with the little star. Pages allows you to add more pages to your website. You can adjust your theme’s color schemes, fonts and backgrounds under Theme. 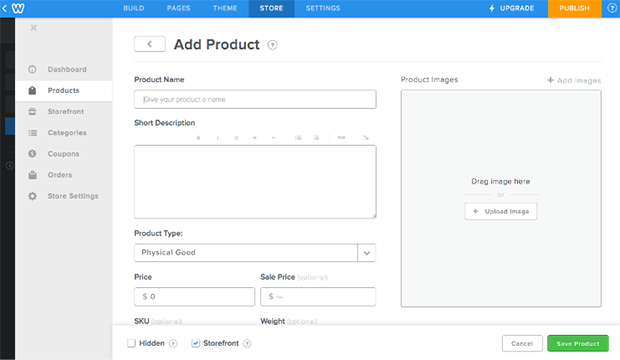 Store is the dashboard for managing e-commerce. Settings allows you to adjust basic settings for your site. The App Center is a valuable addition. You’ll find it under the Build section. Here you can install third-party apps, which are divided into categories such as Marketing, Tools, Communication, eCommerce, and Social. At a glimpse, you will see that a lot of them are free or with a free trial. The majority, however, cost a few bucks a month—or more, in a few instances. Additionally, another nice surprise is automatic save for your edits, so all you need to do is publish your website. Skip worries about whether you did or didn’t save the last change! Having said that, the only serious drawback with the Editor is the lack of online storage and editing for your photos. Although images that appear on multiple pages, like the background, don’t need a re-upload for each page, if you want your image to be available, you’ll need to store it locally and upload it each time you need it. The other drawback is limited image editing, which only has a few rudimentary editing options, like zoom, crop, blur and rotate. In this area, Weebly loses by a big margin. Additionally, another dent in the polished surface is the lack of ability to acquire email services. There is no native email. And the only way to get it is to buy services through Google. Although that’s not a bad alternative, we’re puzzled at the omission of native email service. Right off the bat, all templates are responsive, meaning they are all optimized for smartphones and tablets. There isn’t any need for separate mobile designs. If you want to see how the website looks on a mobile device, there is a view in the Builder editor that will allow you to see the changes. When it comes to the aesthetics of the templates, they are all up to date, modern and stylish. You can edit them via source code or via template editor. Currently, there are 24 templates with the Free plan, and to be honest, considering the competition, that number could be bigger. However, there is an app for mobile devices, so you can edit your heart out on the go. Even with the Free plan, you will easily be able to open a store. Under the Store tab, you will find all the necessities. However, keep in mind that some options, like unlimited products, PayPal checkout, shipping options, and SSL, are available only in the Business plan. 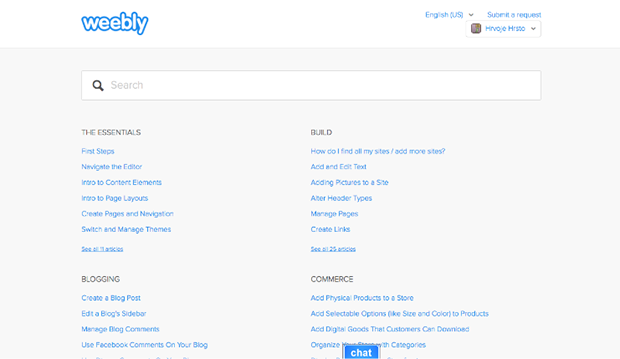 If you’ve never built or operated an online store, Weebly is a great playground on which to learn. However, if you are serious about your business, you will probably want to consider upgrading to the Business plan. Under the General tab in Settings, you’ll find an SEO tab. There you will be able to edit meta keywords, site description, footer and header code, add a redirect, or hide the site from the search engines. When it comes to statistics, even Free users will be able to see page views and visitors, but if you upgrade, you will be able to see more, like search terms used to get to your website, referring sites and top-visited pages. If you want more, there is an option to integrate everybody’s beloved Google Analytics. As mentioned before, you’ll get a free weebly.com domain extension—or you can add your own by upgrading the plan and buying your own domain. Except for the domain cost, there aren’t any additional costs for hosting. There is no critical need for another host and, additionally, it won’t be a big hassle if you decide to move your website You simply download it as a ZIP archive file with all of HTML/CSS. This way, you can move your site to any standard hosting provider. Not all website builders allow you to do this. However, this doesn’t include things like comments or your storefront. It took us a minute to figure out where to access Weebly help or support. In the editor, you’ll see a small question mark in the circle in the upper right corner. Click on that, then click on the Support Center button that pops out (a click extra if you ask us). You will be sent to the knowledge base that is divided into sections and covers pretty much everything you need to know. You can also submit a request (a.k.a. ticket) or engage in some chat. Phone support is available only for Pro and Business plans and it is not available 24/7. However, even in the Free plan, Weebly’s response was timely and the interaction was professional—there isn’t much to complain about here. As mentioned before, there are four plans for Weebly. Connect is $5 a month. Unlike the rest of the plans, it limits your storage space to 500MB. Pro is $12 a month and it allows you to remove Weebly’s advertisement, use your own URL and a few other things, including premium support. Business is $25 a month and it adds few more multimedia tricks and options for membership. Business Plus is $38 a month and it gives you fully upgraded web store, SSL and an unlimited number of products with unlimited members registration. Bear in mind that prices may vary and all prices that we expressed are with a one-year contract. Weebly is like Legos. Even if you have zero experience, the intuitive editor will enable you to build a very satisfying site. For beginners, the Free plan will allow you to explore and see if Weebly is a good fit for you. And we think Weebly deserves a medal for performing the difficult task of adding an automatic save option. The App Center is a nice touch, but Weebly’s themes and designs—and their responsive design—are the real stand-out features. Having a website that isn’t mobile ready is a serious faux pas these days. Store is easy to use but powerful enough for simple users. The only serious drawbacks we could find are a lack of email services, limited image storage and few image editing options. Additionally, if you aren’t on the Business plan, you might be annoyed by elements with stars, that are rubbing in your nose what you don’t but can have. Having said all that, Weebly really is simple enough for anyone, including your nice grandparents who only barely know how to Google things. Keep in mind that simple doesn’t mean unsophisticated. It may look and act like magic, but we believe that the Weebly’s team knows what it’s doing, and it’s doing it right.